I wasn’t going to start this thread until I had more time with this but I’ve got some weird work schedules coming up and don’t know for sure when I’ll get to do some serious testing. Plus I was so impressed with the results wanted to start sharing them right now. First off this is not my AS-EQ1. Charles “CV” shocked me last week buy offering to send his EQ1 to Sean and I for some testing and reviews. Fortuitous for me since I’ve been having a hell of a time trying to tame the bass from just one EP500 in this room and was considering something like this as an option. So many thanks to Charles for being so awesome to ship his EQ1 here. The instructions for the EQ1 are pretty easy to understand (downloadable from SVS website) though I took more care than usual in reading them since it isn’t mine. The software download and install was flawless and my computer immediately detected the EQ1 when hooked up via USB. It would have at that time automatically installed a firmware update but it was already current to up popped the menu. Hook ups for the subwoofer input and output and satellite speaker output (for calibration) are all on the back while the USB port and calibration mic hookups are on the front under a magnetically attached removable face plate. Makes for easy connection all around. The calibration mic looks identical to the Audyssey mic that came with my Onkyo 3007 with the same length cord. It also came with a power cord and USB cable. 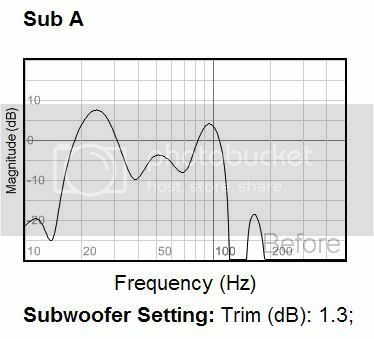 According to SVS website they also now ship a subwoofer cable for adding the EQ1 between the subwoofer pre-out on the receiver and the EQ1. I needed an additional RCA connector (not sure if it’s included in the original box) to hook up the satellite speaker out-put on the EQ1 to the left analogue input of my receiver so it can run a level calibration test between the speakers and the subwoofers. I ran the non-Audyssey calibration routine for the EQ1 as I stopped using Audyssey a while ago since I’ve been doing a lot of speaker position tweaking and hate running it. I won’t give all the details of the calibration routine but it is similar though IMO easier than the regular Audyssey calibration. One nice feature is a redo last option which allows you to discard the just run test and redo it. Nice option if someone happens to knock on your door on the 30th of 32 position readings. Both for simplicities sake and to get the starkest result I ran the calibration for only the sweet-spot using all 32 locations around the head position of my main seat. The before graph exactly mirrors the readings I’ve gotten from my SPL meter when not using Audyssey. With Audyssey on it shaves a little off the curves but I can’t find my notes as to how much so will have to run a LFE sweep to check it again. Not being a very trusting person (they could have the EQ1 generate any graph that they want) I ran an LFE sweep with my Avia calibration disk and Radio shack SPL meter. I got slightly more deflection on the meter than the graph would indicate but not much with -4dB to +2dB being the occasional swings, but mostly the needle stayed within +/- .5 dB. Still way better than either no EQ or just the Onkyo’s Audyssey. One issue did arise at this point. The EQ1 wanted me to set the subwoofer distance to 39.2 feet. Problem is the Onkyo 3007 only goes up to 30 feet. To compensate I set the subwoofer to 30 feet and subtracted 9 feet from all the other speaker distances except the surrounds which are only at 6.5 feet to I set them to .5 feet which is as close as I could. In the limited testing I’ve done I didn’t detect any problems with these settings. I reset all my speakers to 80Hz crossover so that the EQ1 was handling it. Sorry to the measurements are everything crowed but I don’t give a crap how a graph or meter reading looks I want to know how it sounds. So I popped in my most demoed LFE scene, the opening battle of “Master and Commander” Blu-ray version. This was one of those jaw hitting the floor moments like when my I first turned on my projector. I have never in over 3 years heard the LFE from my EP500 sound this good in any room. The cannon shots sounded just as tight as when I only run my M80s but now with the punch of the EP500. Before there was always a bad rumble from the very low frequencies and way to much high end bass while the mid bass punch always seemed to be sucked out (note in my apartment I got much better balanced LFE). No way I could see to A/B this and IMO no need to. I’ve listened to that scene 100s of times and know exactly how it sounded in this room and this sounded so much better there was no doubt. Tossed in Avatar to watch the attack. (Note: Sean, I found out why the LFE didn’t seem all that strong when we demoed Avatar. My EP500 was turned off at the sub so all we were hearing was the low frequencies mastered into the speaker channels with a 40Hz crossover for the fronts). For that matter I think I’ve been running w/o a sub for a couple weeks and didn’t even notice it because of my M80s . Now I realize there is actually some bass in that scene. Most notable was one explosion that sent a visible shockwave past you on the screen with a corresponding midbass shock wave in the room. Actually made me flinch. Not quite a good a punch as sitting 6 feet from my M80s but getting there. In the Mines of Moria the footfalls of the Balrog were now more distinctive again, something I hadn’t heard since my apartment. Also when it roared there was much more of the misbass in-your-face feeling like it was actually standing right there. For music I popped in Celtic Women "Sí Do Mhaimeo í" (The Wealthy Widow) to hear those big monster drums. What a huge improvement. In the past even in my apartment I preferred the 2.0 version because the drums just “rumbled” to much, but this was far better now in 5.1. 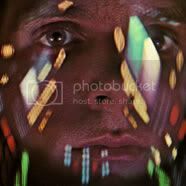 As another music test I cranked up some Goa Trance and heard rapid deep bass like I had never heard before. Previously I only listened to this with the M80s because the room just screwed up the sound of my sub turning the bass all mushy which just doesn’t work at 150 beats/minute. This sounded so good I just let media monkey keep playing trance for half an hour before opening it up to all music. Now for the first time in this room I can listen with the subwoofer on. More generally I noticed several notable improvements when the EQ1 was on. First there was much more midbass punch likely because the overall subwoofer level was turned up +7dB from pre calibration and the midbass dips were gone. The deep overpowering rumble that likely forced the subwoofer level to be turned so far down was gone but w/o loosing any of the room/furniture shaking when appropriate. The entire bass range sounded tighter and flawlessly integrated with the M80s. I never liked the sub in this room for music before. With the EQ1 I can’t imagine not using it. Ok this was a very limited test and not very realistic since most people will want the EQ for multiple seats. Yes that will be one of the next tests. Also, I believe Sean is going to bring over a pair of matching subwoofers so we can see how well it does with both similar and different subwoofers evening out the bass across multiple seats. 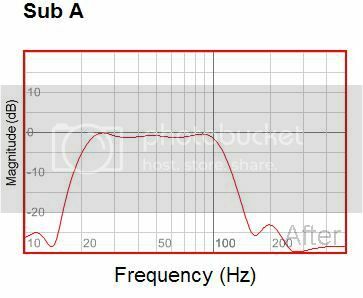 I can say right now without reservation that if you want to EQ a subwoofer for just the sweet spot just go out an buy an AS-EQ1 right now because it works. I hope to see how it does over a row and two rows of seats soon. If anyone has a specific test they’d be interested in let me know and I will try to work it in or pawn it off on Sean later. I’m temped to order an AS-EQ1 right now but plan on holding off until I see the results across multiple seats with both a single and double subwoofers. Also I want to research if anything is available like a pro version that allows a user defined target curves. I would like to be able to up the midbass even more when I want to. Thanks again Charles. I never would have expected this much improvement in SQ from the AS-EQ1. Whoa, sounds like you got immediate and positive results, Dean! Looking forward to hearing it, too. LOL! That's good to know about Avatar as we were puzzled why others seemed to be raving about the bass. Still, just the M80s alone was pretty impressive. come on Grunt, don't you know that using such Audyssey products is a snake oil technique. You know I'm kidding, great results. Great results Dean, makes me want to get an AS-EQ1. Nice write-up. Already way more helpful than mine. I'm glad you found it worthwhile in your room. I look forward to reading your further experiences. I hope to see how it does over a row and two rows of seats soon. If anyone has a specific test they’d be interested in let me know and I will try to work it in or pawn it off on Sean later. I'd be very interested in hearing your results regarding multiple rows and/or seats. Very good, Dean. One of the interesting aspects is that I'm sure that the 39.2' sub distance isn't the actual physical distance, so the effect of the delays in the sub is again illustrated. Thankfully it showed up as just over 30 feet the first time I ran it and then just under 30 feet the second time I ran it. My Integra also has a maximum distance setting of 30 feet. No the actual physical distance is about 11 feet and my Onkyo was setting it around 23 feet when positioned there. It will be interesting to see what distance it gives for one of Sean’s smaller subs which I presume don’t have DSP chips. Lucky for me most of my speakers are 9 feet or more away most importantly my mains so I could compensate. I will try moving my EP500 closer, about 6.5 feet away so I can get my surrounds set correctly but at least so far I’m not hearing any timing problems with the surrounds set 3 feet closer than any of the other speakers. If I ever get off my lazy but and mount the surrounds up higher that will likely put them closer to 8 feet away.